Spicy Orange Chicken, adapted from Chef John’s Spicy Orange Wing Sauce on AllRecipes.com, is a delicious, quick and easy weeknight take-out, fake-out dish brings back a little nostalgia for us. It reminds us of this little locally owned neighborhood chinese hole-in-the-wall restaurant that had been there for years at the time we moved into our neighborhood almost 25 years ago. The older chinese lady, who seemed like she must work there 24 hours a day, always greeted us with a laugh and smile. My husband, who always had a funny story to tell, could make her roar with laughter each time we saw her. I felt that if she had the time, she would have loved to have pulled up a chair at our table and chatted with us the whole evening. My husband and I ate there regularly not only because of this wonderful lady, but because the food was always freshly prepared and wonderfully flavorful. Sadly, this little restaurant had to close when that large supermarket in the shopping center went out of business. 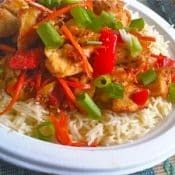 So when my husband told me that this Spicy Orange Chicken dish was even better than the Orange Chicken from our favorite chinese restaurant, I was thrilled. I knew I had a winner. And not only is this Orange Chicken NOT fried, it has lots of vegetables, and lots of flavor, and is ready in only 30 minutes so it makes a great quick and easy weeknight meal. How can you get any better than that? Who needs Chinese take-out when you have this? Over medium high heat, add 1 tablespoon grape seed oil. Salt and pepper the chicken to taste. Once oil is hot, add chicken to brown and cook through. Add the vegetables to pan for about 5 minutes. Meanwhile, in a small bowl, stir together the orange marmalade, rice vinegar, hoisin sauce, soy sauce, chili pepper sauce, garlic, and ginger together and stir until combined. Pour the sauce over the chicken and vegetables. 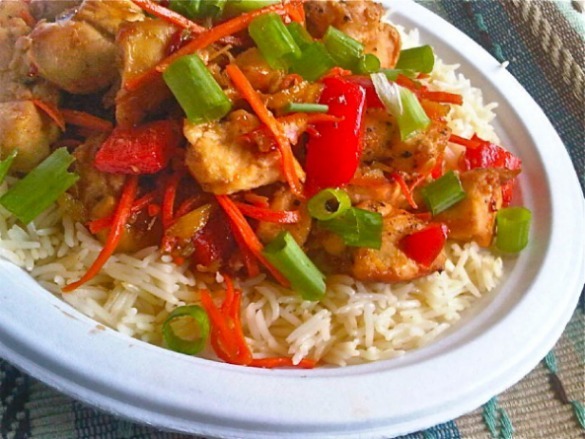 Serve over white rice and garnish with chopped green onions. For a delicious appetizer to go with this Orange Chicken try these Chicken, Bacon, and Scallion Dumplings with Spicy Garlic Dipping Sauce from one of my blogger friend, Healthy. Delicious. For another Asian-inspired chicken recipe try this Grilled Peanut Ginger Chicken from my friend, Renee, of Renee’s Kitchen Adventures. I’m all for quick and easy weeknights (although the last two haven’t been for me!). I’m also a huge Asian food fan so this recipe totally appeals to me. Sweet heat is one of my favorites…will definitely give it a try soon! Thanks Shelby for stopping by. This is one of my weeknight go to meals because it is so easy but delicious. Are you sure this recipe serves 30????? ?